But now, this is what the Lord says—he who created you, Jacob, he who formed you, Israel: “Do not fear, for I have redeemed you; I have summoned you by name; you are mine. When you pass through the waters, I will be with you; and when you pass through the rivers, they will not sweep over you. When you walk through the fire, you will not be burned; the flames will not set you ablaze. Last week, my husband and I visited Boston for the first time. 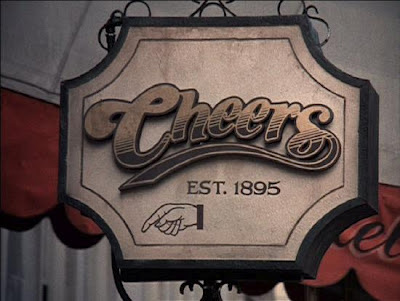 As we strolled down beautiful Beacon Street, we passed by this familiar sign: Cheers. Of course, we immediately began singing the lyrics to the theme song from the popular '80s TV show. The song made it abundantly clear to me why so many hit up their favorite watering holes every night - because they're known there. It's a family, a community, a place where people can talk and share openly, without others judging. The frequenters of this scene seem to understand something that I've so often missed: we all have problems. We all desperately yearn to be defined and identified not by our problems, but by our names. On several occasions, the Bible makes it abundantly clear that God calls His children by their names. Not failure. Not liar. Not addict. Not adulterer. Not invalid. Not indigent. No, no. He calls us by our names, because once we call on His name, our identity is that we are His, nothing else. Oh, that I would remember this simple truth! Today, I'm challenging myself to do my part to make the body of Christ more like Cheers, a place to get away from the troubles of the world and get with the ONE who knows our names.